Yesterday I did a full count of the many yoga pants I’ve purchased since I immersed myself in the wonderful practice of Yoga. Sure I still couldn’t pronounce nor remember properly the Sanskrit terms for the poses but really it’s the execution that really matter right? Anyway, I counted 12 and I think, I may have some more in the depths of my closet but whatever! I want more!!!. They are so comfortably awesome. I wear them at work without looking like I am ready to do a dancer’s pose anytime. With the right accessories and a little bit of attitude people might not even notice it. I also use it on Saturday and Sunday mornings errand with the children before attending an afternoon class. 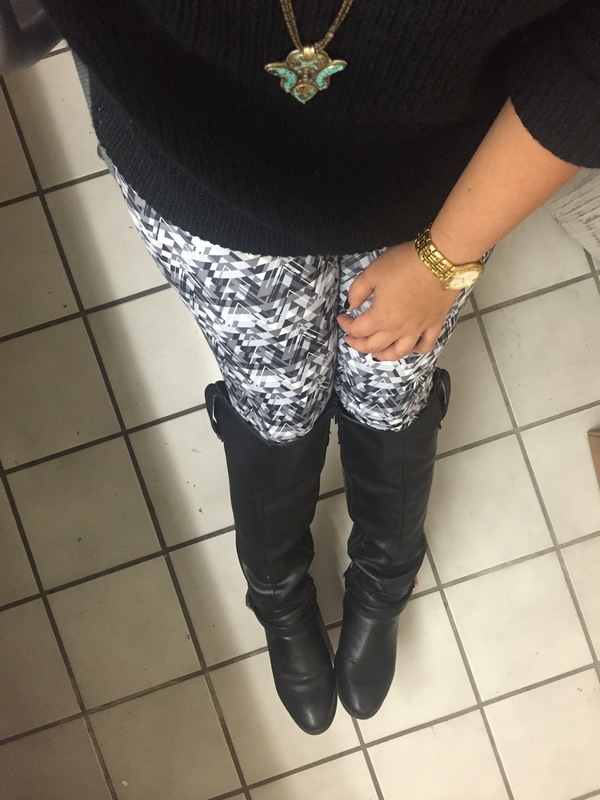 Leggings and knee high boots are my absolute staple pieces during the winter season. It is the one thing I can wear 5 days a week, so really the excessive purchase of yoga pants is not an excess at all since a. I use and need it for yoga b. it is an excellent alternative to the boring cotton material leggings c. I you don’t know yet, I have a penchant for psychedelic-ish and print design on pants c. duh! multi-use anywhere – studio, work, lounging, lazy days. I’ve been practicing Yoga since June and have yet to buy any. Those are super cute. I know between these and Harem pants, once I start there will be no stopping haha! Isn’t yoga awesome?! How many times a week do you practice? Did you find a perfect studio to practice? The pants! Oh I am obsessed! I go through this kind of shopping phase, I am hoping this will die down soon. Before this was a ankle strap shoes obsession and that totaled to 30 pairs. lol I resell most of them but kept some. I do a little or a lot each day haha. Depends on how my body is feeling, and I’m more along the lines of a loner, at-home type of Yogi-in-Training. It’s hard for me to get out, but I don’t let it stop me!